By June 1776, the British had taken over Boston, attempted to confiscate the arms of the local militias (leading to Paul Revere's Ride and the Battles of Lexington and Concord). After their defeats at Lexington & Concord, the British determined to pacify Boston by force at the Battle of Bunker Hill. While the British prevailed, 400 Patriot volunteers took 1,000 British regulars with them. The last Olive Branch Petition to the King had been returned from London and read aloud to the Congress by President John Hancock. The King had resolved to ignore them and also brand them traitors; all who did not immediately capitulate and surrender would face death. The British were regrouping after a temporary withdraw from Boston while sending fleets and German mercenaries up the Hudson to New York and up the Delaware to Philadelphia. The only thing standing between the Continental Congress and total British victory were the river defenses in Delaware. 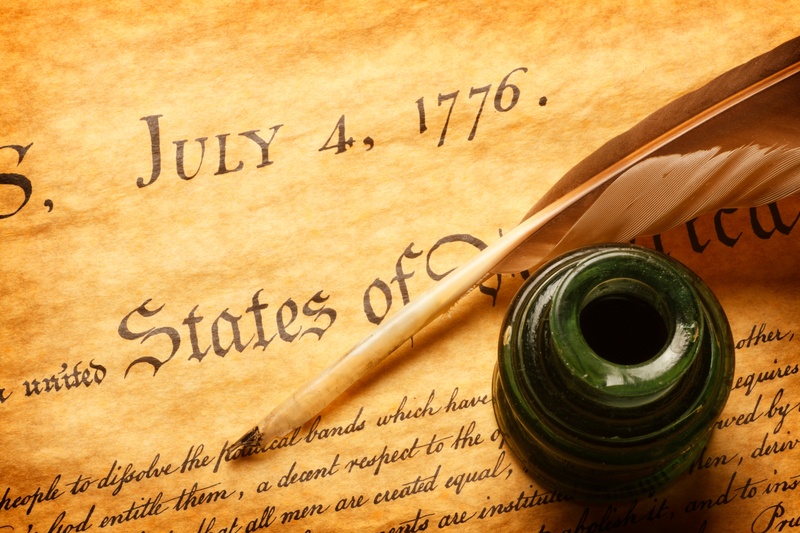 On June 7th, 1776, Richard Henry Lee of Virginia proposed a Declaration of Independence. After a lengthy debate over several days led by John Adams, a 20 day recess was called to allow delegations to seek instructions from their constituent assemblies. As the British marched into New York, the Provincial Assembly was forced to flee and the New York delegation was put in a precarious position: obey last instructions and vote against or vote rogue and invite the British to burn the city to the ground. The Continental Congress re-convened on July 2nd and unanimously declared independence with New York abstaining to prevent the British sack of the city. Two days later the Congress would agree on the very wording of the Declaration, drafted by Thomas Jefferson but heavily edited by the Continental Congress as a whole. At this point in time the war could have very easily been lost and there were no guarantees that even the politicians leading the effort would escape British judgement. This vote marked these men for death and they would spend the better part of the next month sneaking in and out of the city to sign the Declaration. On the 4th of July, 1776, John Hancock declared, "We must be unanimous. There mustbeno pulling different ways. We must hang together." In response, to echo his sentiments, Benjamin Franklin stated, "We must, indeed, all hang together, or most assuredly we shall all hang separately." They sure had a way with words. Thank you to all who continue to serve and uphold these rights passed down for generations by the first American heroes! Our office is closed today. Have a great (and SAFE) holiday!